The ASUS RT-AX88U router with 802.11ax Wi-Fi technology delivers ultrafast Wi-Fi speeds, improved network coverage and capacity, and longer battery life for connected devices. The RT-AX88U features a powerful 64-bit 1.8GHz quad-core processor to ensure smooth and responsive performance as well as two USB ports and eight Gigabit LAN parts to provide users the flexibility to expand and configure their network the way they want. The ASUS ROG Strix GL702ZC is one of the first AMD Ryzen based laptop – and not just any ordinary laptop, it’s a gaming laptop to boot. The catch: The CPU isn’t a mobile-variant Ryzen, instead it’s a meant-for-desktop Ryzen 7 1700. I was definitely curious as to how it performed. It’s been years since AMD had been able to compete head to head with Intel, and even more so from the laptop perspective. The new All-in-One ASUS AiO ZN242 is a compact and elegant 23.8-inch all-in-one PC with frameless NanoEdge display for immersive visuals. Powering the Zen AiO (ZN242) is a 7th generation Intel® Core™ i7 quad-core processor, 16GB of DDR4 RAM, and gaming-grade NVIDIA® GeForce® GTX 1050 graphics. 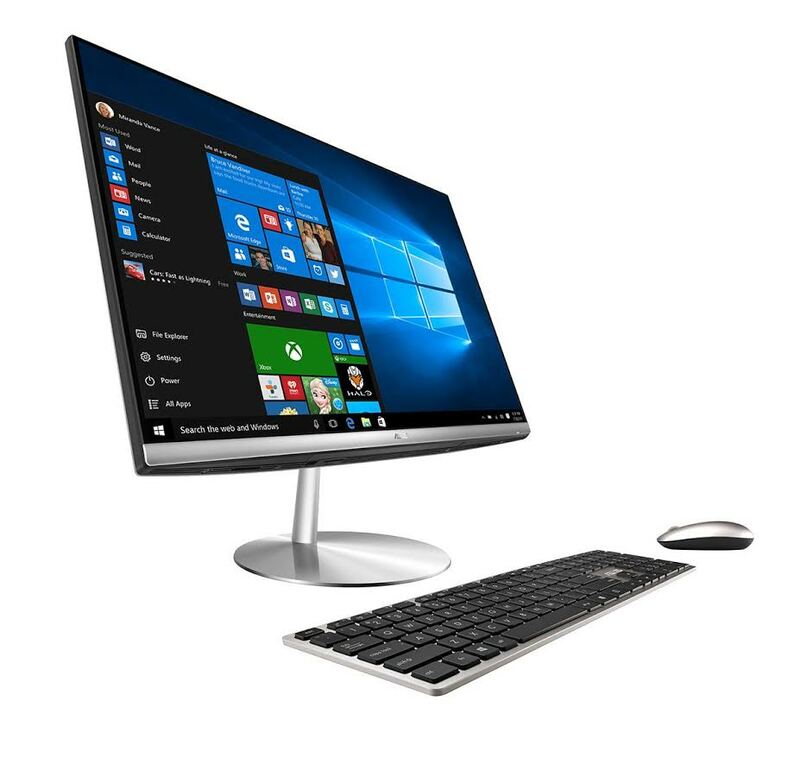 The Zen AiO (ZN242) is suited for those looking for a clean and uncluttered all-in-one PC with a metal-like Icicle Silver finish, and features many thoughtful and practical touches including a pop-up camera and hidden cooling vents in the rear logo. It has a sturdy, diamond-cut stand with an ultra-slim metal base adorned with our iconic Zen-inspired spun-metal finish. Starting from today, the Zen AiO (ZN242) will be available at all ASUS Brand Stores and authorised retailers at $1,998. The Zen AiO (ZN242) has a 23.8-inch Full HD NanoEdge frameless display with a near-invisible 2mm physical bezel, giving an industry-leading 90% screen-to-body ratio for immersive viewing. The ultra-slim bezel reduces the overall size of the device, making it similar in size to some 22-inch AiO models. This gives it a slim and compact design that allows users to maximise space in the home. The NanoEdge display features 178° wide-view technology that makes it perfect for sharing pictures or videos, while the wide 100% sRGB colour gamut ensures richer and more life-like colours. The Zen AiO (ZN242) delivers the performance of a traditional desktop PC, and it can handle even the most demanding tasks with ease thanks to its 7th generation Intel® Core™ i7 quad-core processor — one of the most powerful models in the Intel consumer processor lineup. And with 16GB DDR4 RAM, the Zen AiO (ZN242) makes multi-tasking effortless. Gaming-grade NVIDIA® GeForce® GTX 1050 graphics gives it the visual prowess to handle the most graphically-demanding AAA games or video-editing software. The Zen-inspired design of the Zen AiO (ZN242) has beautifully clean and uncluttered lines that bring a touch of simple elegance to any environment. Its solid-metal stand is slim and unobtrusive, with a perfectly balanced hinge for easy tilt adjustment. The metal-like rear cover features an ingenious ventilation system incorporated in the ASUS logo, keeping it cool without the need for unsightly grilles. And to add subtle brilliance, the stand base and power button feature the iconic ASUS spun-metal finish, with its lustrous pattern of concentric circles. With its two powerful bass-reflex stereo speakers and exclusive ASUS SonicMaster Premium audio technology, the Zen AiO (ZN242) delivers a total of 6W of incredibly rich and crystal-clear sound. A smart amplifier intelligently monitors and adjusts the speaker output to product the maximum possible volume with minimal distortion for truly immersive entertainment. The Zen AiO (ZN242) is packed with clever and practical details, like the pop-up camera on the top of the display. For privacy, the camera is neatly hidden when not in use. But with just a touch, it is ready for action. Far-field voice-recognition microphone technology allows users to access Cortana from up to four meters away, enabling them to interact with the Zen AiO (ZN242) even in noisy environments or from across the room. Looking to build an ultimate gaming rig? The latest Asus ROG motherboard can help get you started. This high-performance Z270 gaming motherboard comes with integrated monoblock water-cooler, Aura Sync illumination, exceptional audio, multiple safeguards, and latest connectivity. I have not really kept up with the latest in PC technology, but here’s a quick refresher on the latest features to look out for. It’s a long list and an excellent starting piece for your ultimate gaming rig. Zenbook Flip is Asus’s method of combining convertible 2-in-1 with their high-class Zenbook laptop range. Asus ZenBook Flip UX360UA is their one of the latest attempt at creating the perfect convertible and it is one of the most powerful convertibles around. Unlike the previous Zenbook Flip UX360CA which runs on Intel® Core™ M3 CPU, the review UX360UA unit is running on an Intel® Core™ i7-6500 CPU along with 8GB DDR3 RAM and 512 GB SSD to ensure the snappiest performance. 13.3″ QHD LED IPS screen sounds like the sweet spot for convertible laptop size. The only concern with the glossy screen is that it’s highly reflective under strong sunlight and it might not be the perfect device to be used outdoor. On the other hand, based on indoor usage experience, this is by far one of the best screen display I have seen with its high resolution and vibrant colour. I would personally prefer a matte display for future models. The trackpad on the UX360U is on par with Macbook standard in terms of size & comfort. If you are worried about accidental click you are able to disable it via the keyboard command. On the other hand, the backlit keyboard is surprisingly pleasant to use and well laid out with enough travel between keys. On the other hand, the hinge on my review unit got a minor issue that the screen moved when you are using the touch screen on few different angle. You may wish to take note on your unit if you are interested in using it in table top mode. Battery life on UX360 is decent like the majority of the Thin & Light laptop in the market, I used it at a local Starbucks for 3 hours and the battery went down from full battery to around 60%. Do note that I was using it to stream Spotify, watching Youtube videos & web browsing. If you are using it for basic web browsing and document editing purposes, you should be able to stretch the battery life to a longer duration. Available now at all major IT outlets, with the price starting from S$1,598.00 for i5 model to $1,898 for the i7 model, it’s not the cheapest convertible we see around but it is one of the most powerful convertibles that can fulfil most of your needs on the go. For those who are budget conscious and does not require the top performance on the go, you may wish to consider the intel core M3 model UX360CA with a slightly different design that is also available right now at a cheaper price. The ASUS Zenpad 3 comes in at the size of an iPad Mini, and includes a default 4G SIM slot for anywhere connectivity. Now, the Zenpad 3 comes with a gorgeous high-resolution 7.9-inch IPS screen, and a relatively fast Snapdragon 650 paired with 4 GB of RAM. It’s perfect for watching shows, especially with the front facing stereo speakers. The only caveat, the tablet like the iPad Mini, runs on a 4:3 display ratio, which means black bars for most of today’s movies and tv shows. It’s a small annoyance, for the 4:3 ratio makes it otherwise great for reading published content, and also really comfortable to hold landscape and portrait. Worthwhile trade offs. ASUS mini PCs, the VivoMini VM65N and VM65, have been updated with the latest 7th Generation Intel Core Kaby Lake processors. The other specifications remain the same. In a nutshell, these mini PCs can pack a punch. Newer is always better, and the updated PCs are expected to deliver an 11 percent performance increase over last generation chips. The systems are powered by the latest 7th Gen Intel Core processors (i7, i5, i3 options) and are equipped with two SO-DIMM slots for up to 16 GB of DDR4-2133 memory, slots for one 3.5-inch drive (or two 2.5-inch with optional Vivo DualBay), an 802.11ac Wi-Fi module, Gigabit Ethernet, a 4-in-1 card reader, four USB 3.0 ports, or two USB 3.1 type-A ports (the VM65N only), one audio output jack, an HDMI connector, one Dual-mode DisplayPort output, built-in 2x2W SonicMaster speakers and a Kensington lock.